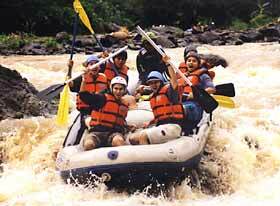 Bali offers not just various customs but also various “adrenalin pump” parks. Many exciting amusements are available in Bali, with something new opening all time. The number of offshore and inland attraction are on the rise because many tourists want them. For people with strong confidence and no heart problems, a must is bungy jumping and slingshot. Slingshot will shoot you up skyward so you can feel like a bullet. Bungy jumping offers you a chance to take the plunge. You can choose your view, wanna Kuta’s view (in Kuta) or natural waterfal’s view in Gianyar. If you want to experience “war in paradise” Fantasy Bali Splat Mas-Jungle Skirmish is the place for you. It is a war game, where the point is to capture your opposing team’s flag and kill the enemy with paintballs.